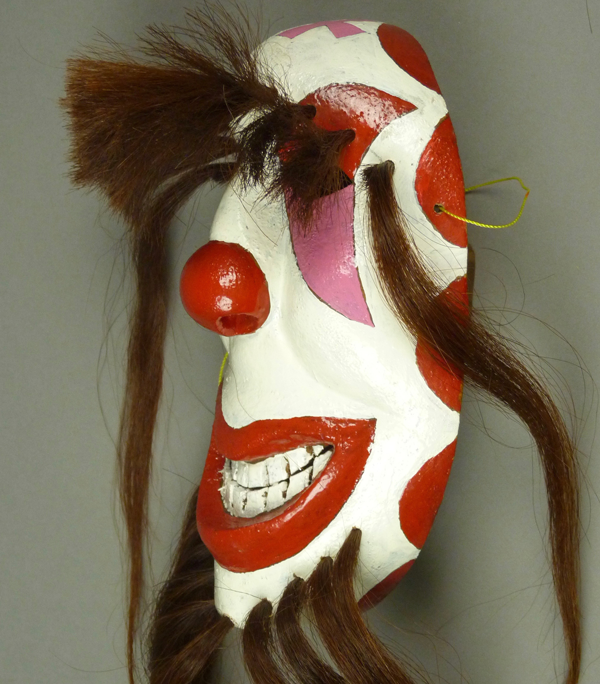 I had purchased my first Payaso (clown) mask by Crisencio in 2006, from the Morning Star Traders gallery in Tucson, Arizona. Since then I have bought six more. 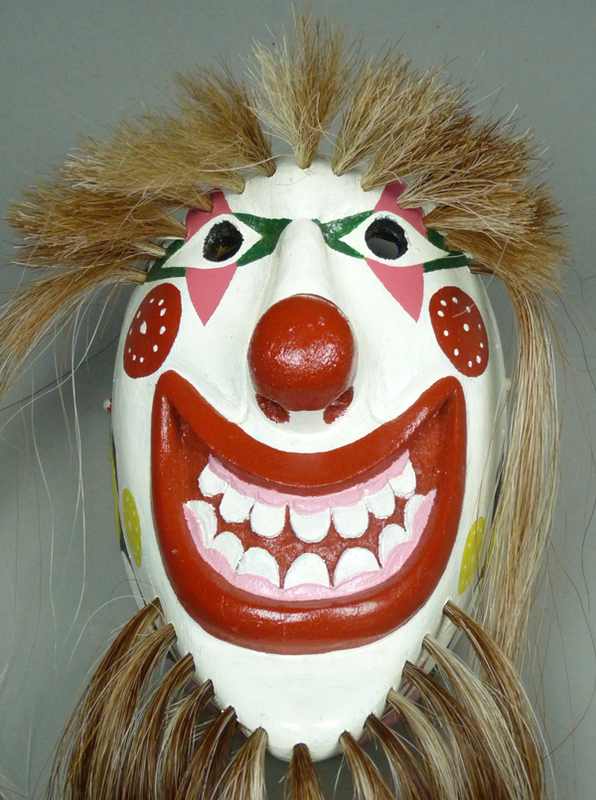 These clowns will be the focus of today’s post. Here is the one from 2006. 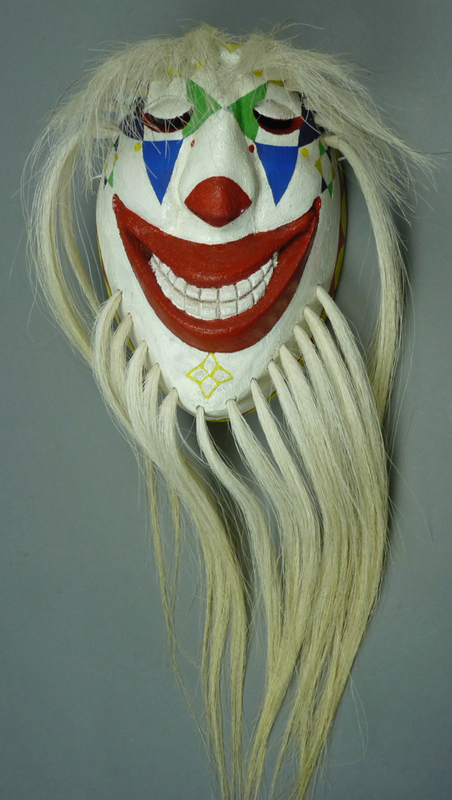 Isn’t this a wonderful mask! The triangles under the eyes, which the Yaquis often refer to as “tears,” have been replaced by tiny inverted triangles that do mimic weeping. The vision openings are nearly invisible slits under the painted eyes, a design detail that we saw on another mask by Crisencio in last week’s post. 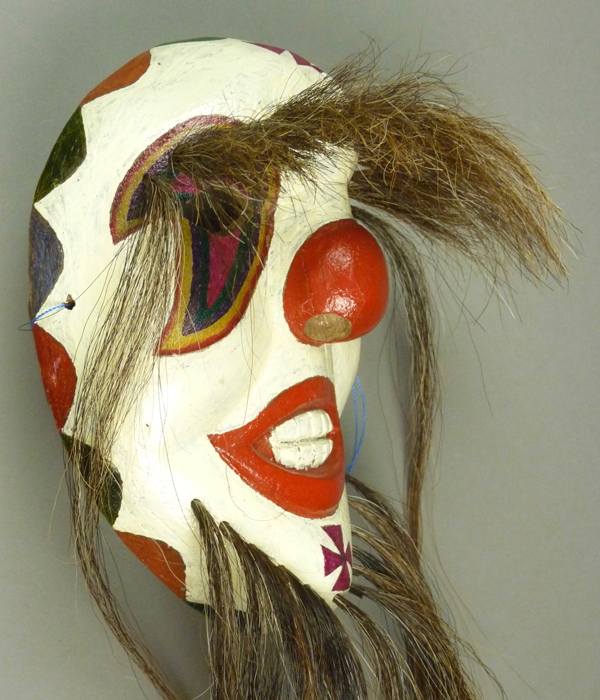 The nose and mouth on this mask are small masterpieces. 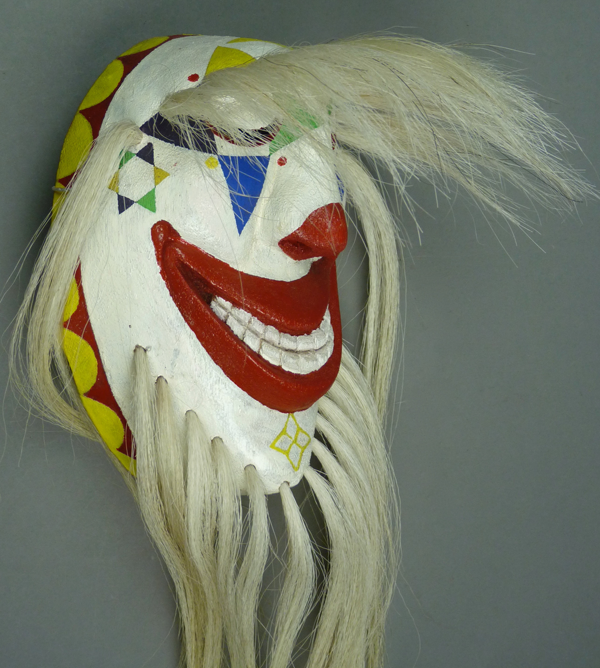 In contrast to the weeping eyes, the remarkable exaggeration of the curled corners of the mouth suggests the opposite emotion. 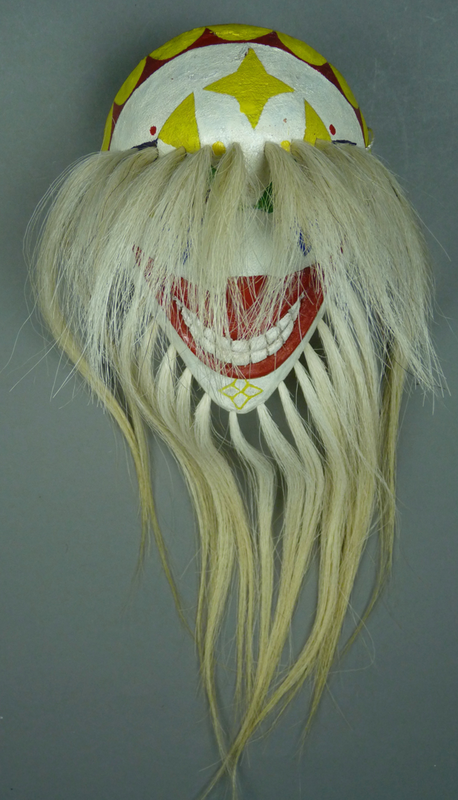 The design that replaces the usual forehead cross resembles a flower. On the chin, a black diamond echoes the color of the eyes and tears, reinforcing the suggestion of warring emotions—”The tears of a clown” (Smoky Robinson, 1967). 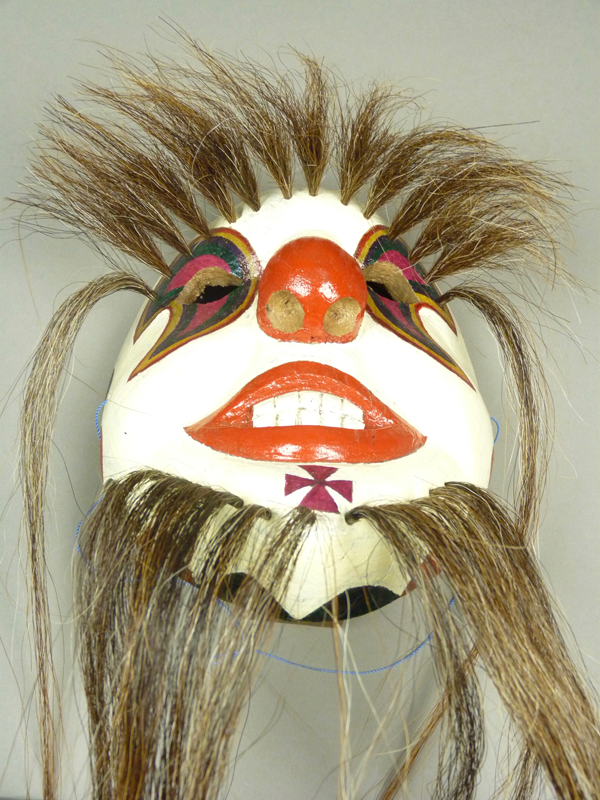 This mask is 7½ inches tall, 5 inches wide, and 3 inches deep. 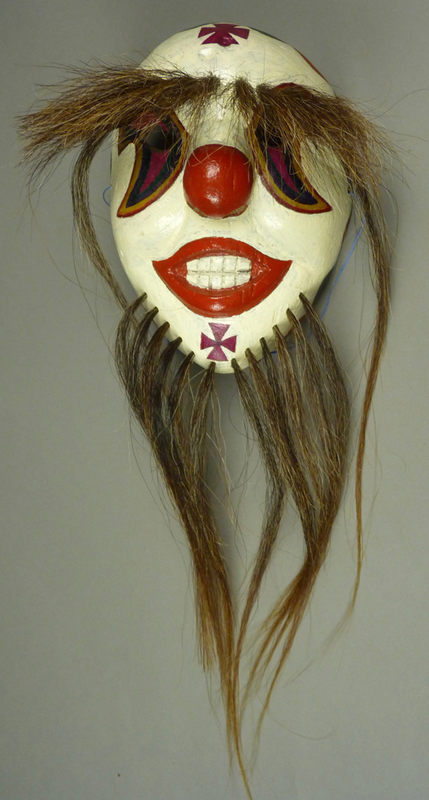 The name on the back marks this as one of the masks from the Morning Star Trader gallery. 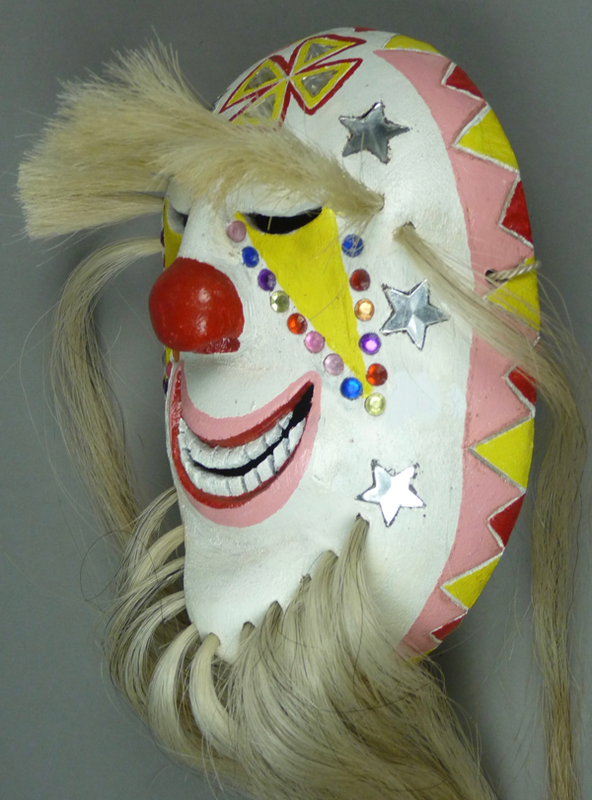 My next clown mask, which was purchased from Crisencio a year or so later, is much more modest and conventional. It is about the right size for an adolescent dancer. Note the crescent design, in pink and red, that frames the eye. There is a conventional forehead cross, while the chin is bare. 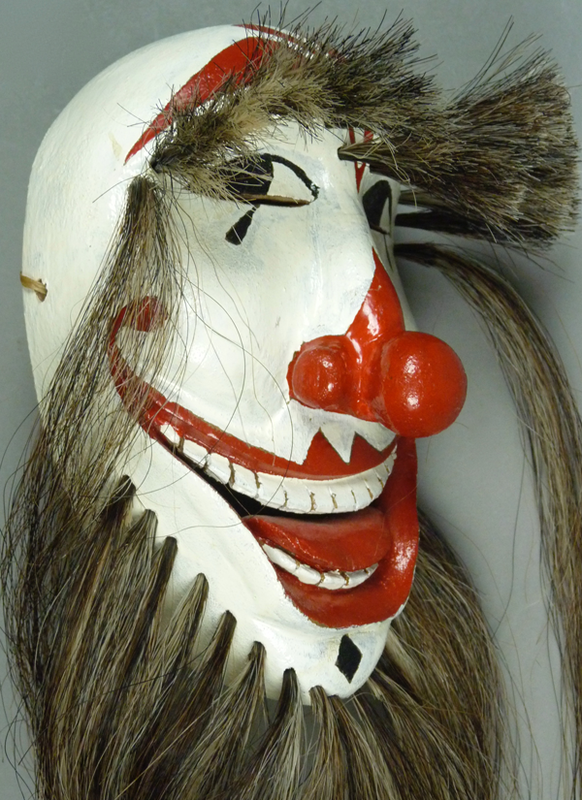 This mask is 7¾ inches tall, 4¾ inches wide, and 2½ inches deep. The back is unstained, and unsigned. 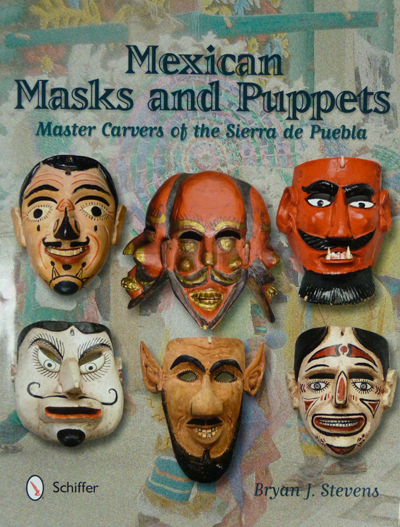 Tom Kolaz purchased the third mask from the carver, on 11/3/2007, after it had been danced at “39th Street” (Barrio Libre) in Tucson. These boomerang shaped tears combine many contrasting colors. The forehead and chin crosses are magenta. 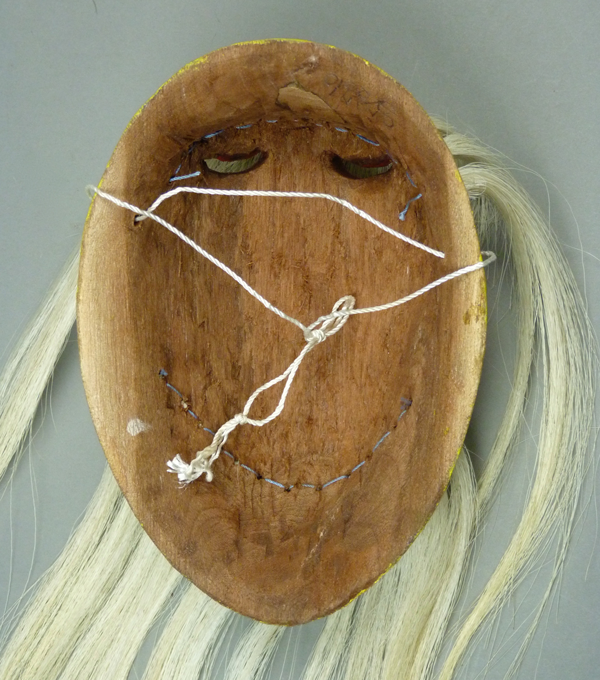 This mask is 8¼ inches tall, 6 inches wide, and 3 inches deep. 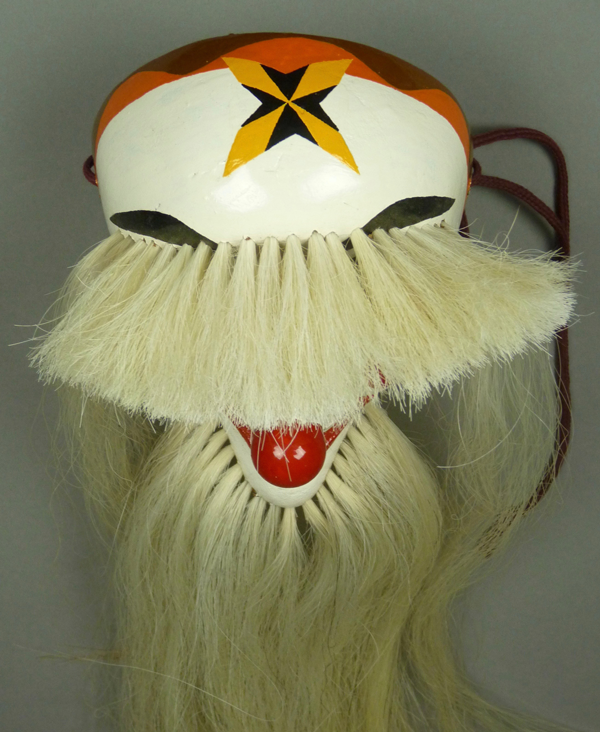 The back is only lightly stained at the forehead and chin, from use. 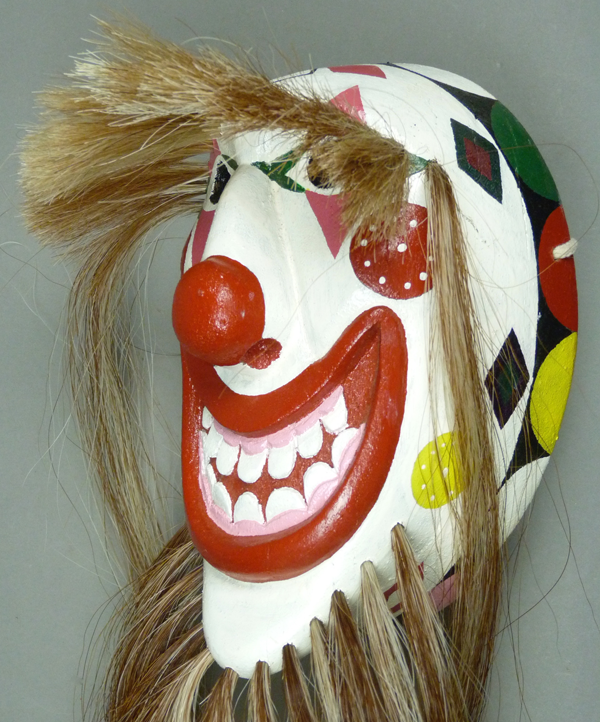 This fourth Payaso was collected from the carver in about 2008. It is studded with sequins and plastic ornaments. 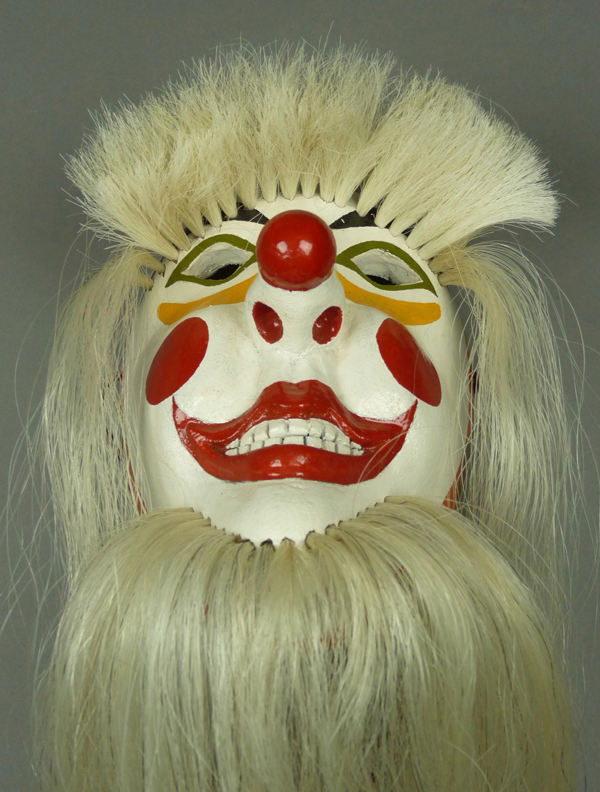 The colors on this mask are festive. Counting the forehead cross, there are seven stars or planets. 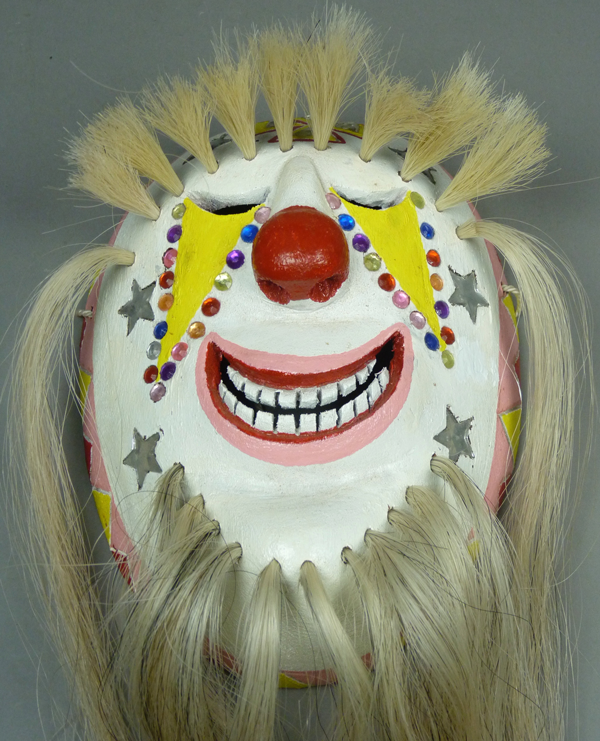 This is a clown of light, a figure who brings the night sky to those living on earth. 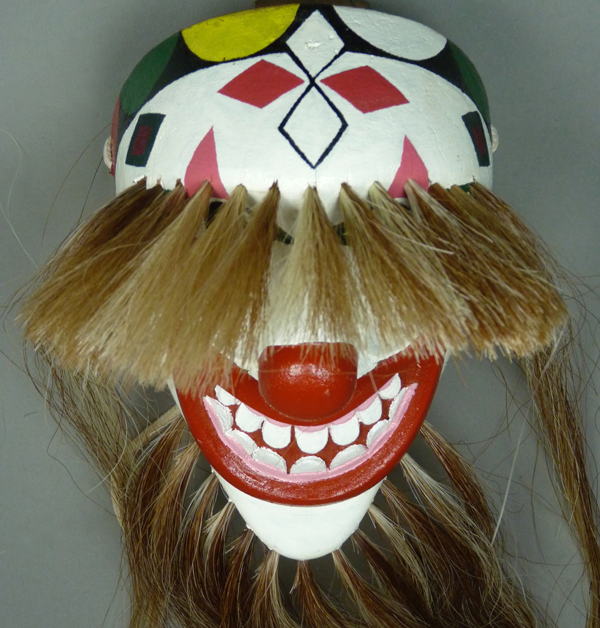 Describing the mask in this way reminds me of the Yaquis’ parallel worlds. 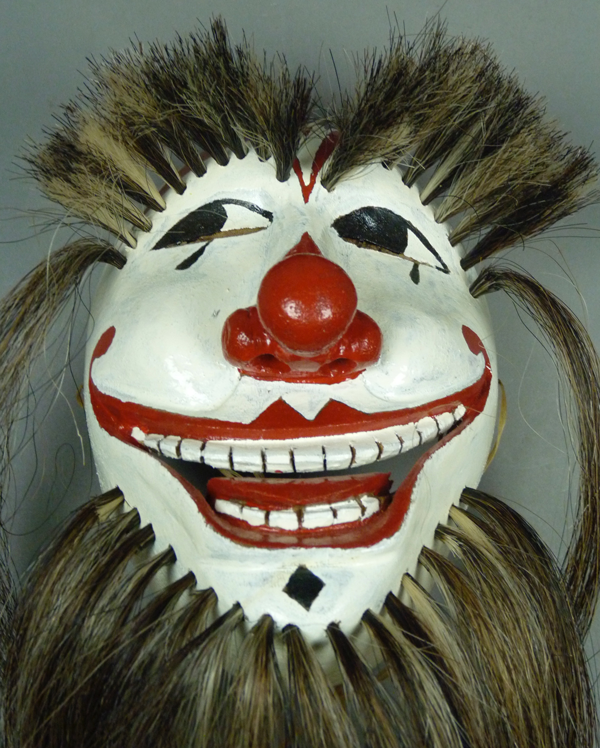 This mask is 8¾ inches tall, 6½ inches wide, and 2¾ inches deep. 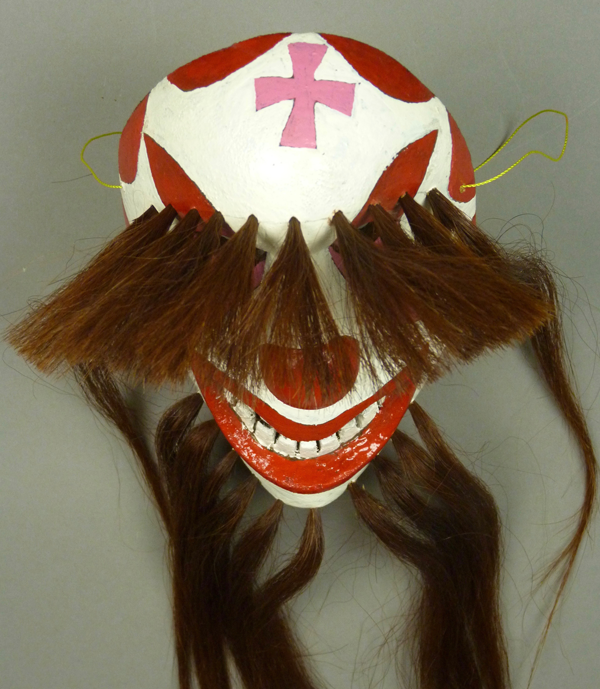 The next clown Pascola mask was collected in about 2009. 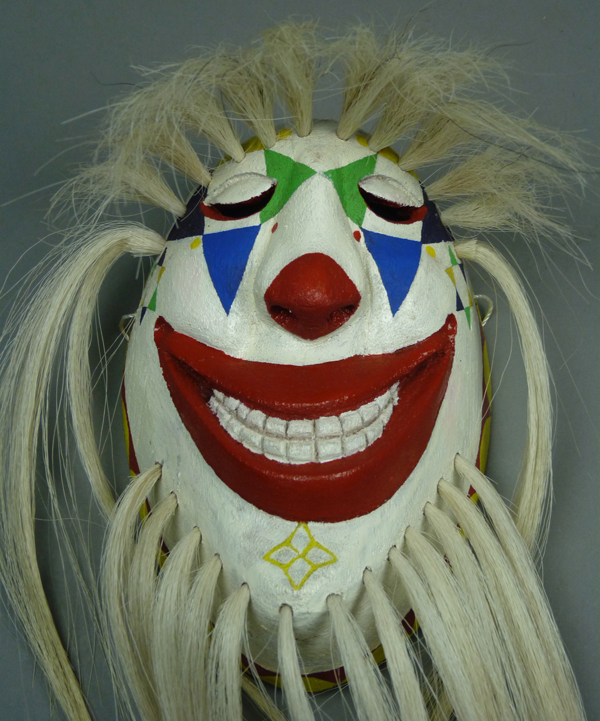 Despite the big grin and the bright colors, this clown somehow manages to look malevolent. There are red spotted circles along with yellow ones. The four triangles around the eyes create the shape of Venus, the Morning Star. 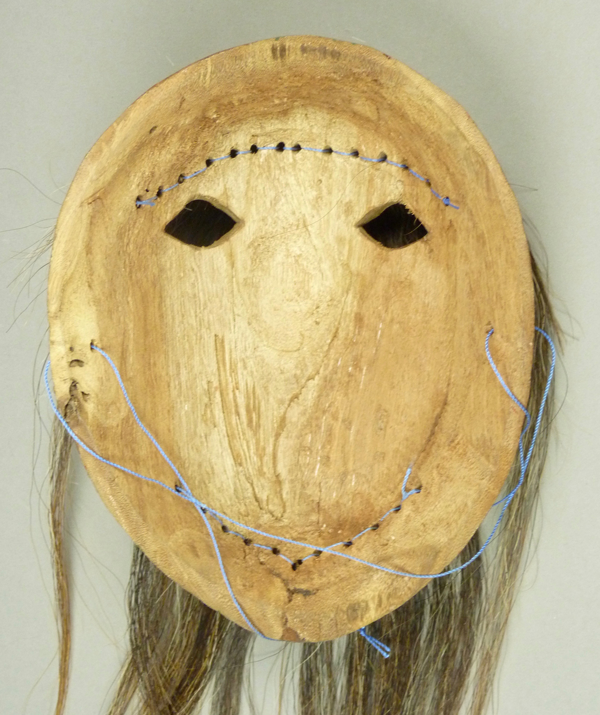 This mask is 8 inches tall, 5½ inches wide, and 4 inches deep. The back and the strap are unstained from use. 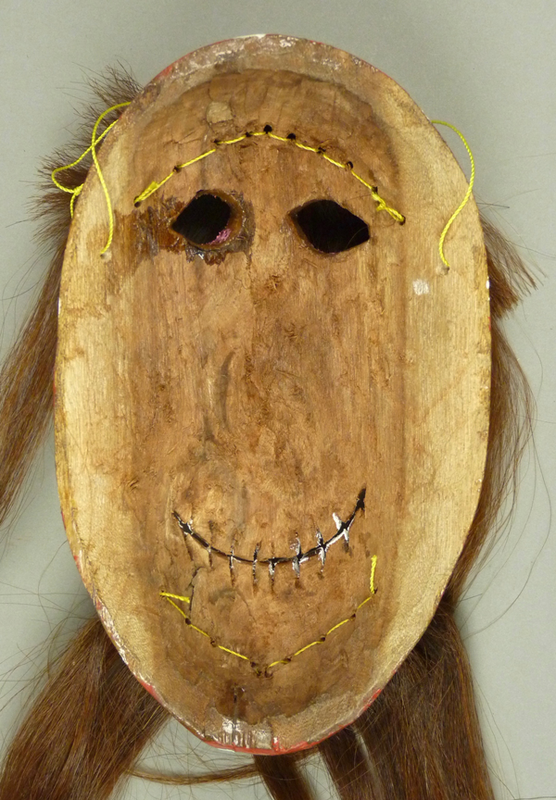 This one was collected from the carver on September 8, 2010. 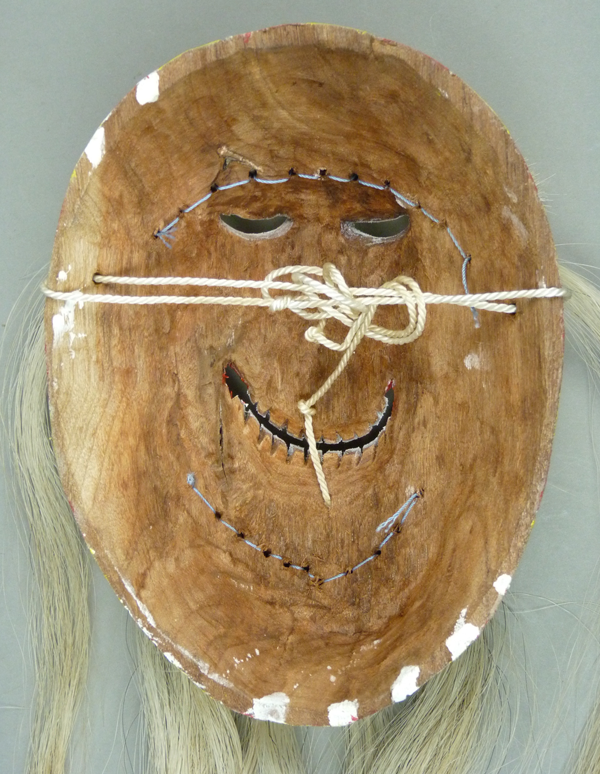 Like the last, this one also has four triangles around the eyes. There are hexagons, constructed from triangles, on the cheeks. Yellow designs dominate on the forehead—triangles above the eyes, the forehead Morning star, and the scalloped rim design. 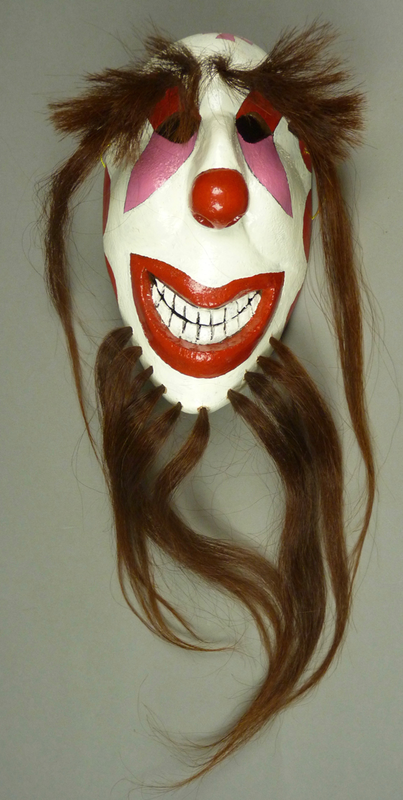 This is one of the most beautiful of my clowns. 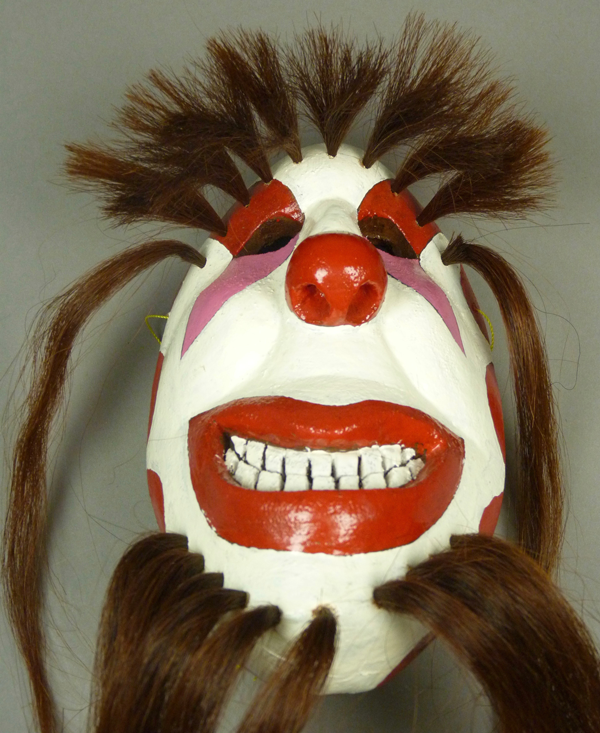 This mask is 8 inches tall, 5¼ inches wide, and 3¼ inches deep. The carving of the back is typical of Crisencio’s work. 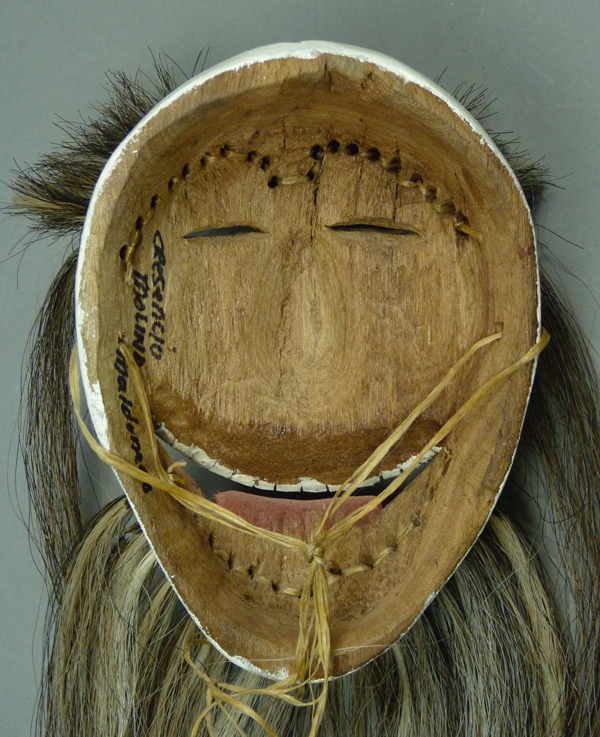 The last of these Payasos was purchased from the carver in March, 2017. 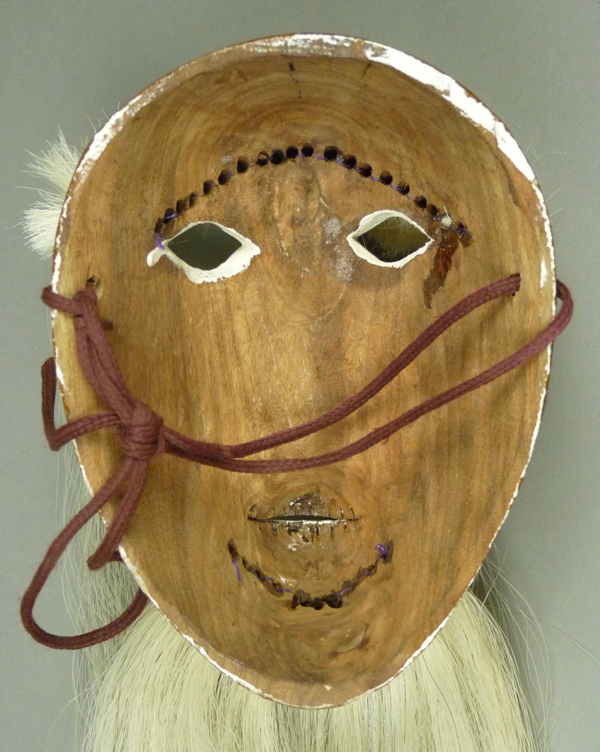 This one looks more like a beautiful woman than all the rest, albeit a woman wearing a false nose. 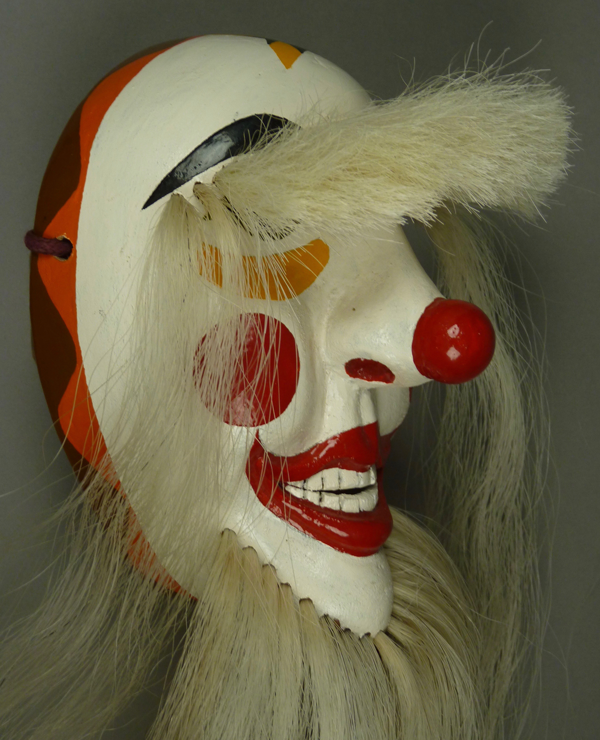 We see the pointed chin that we have previously encountered on other masks by Crisencio. 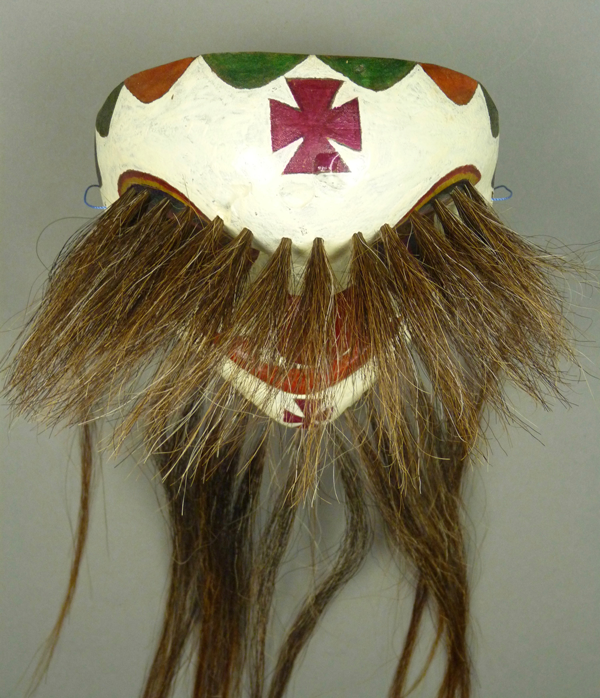 This forehead cross is most unusual and beautiful, and it is particularly striking in combination with the colors of the rim design. 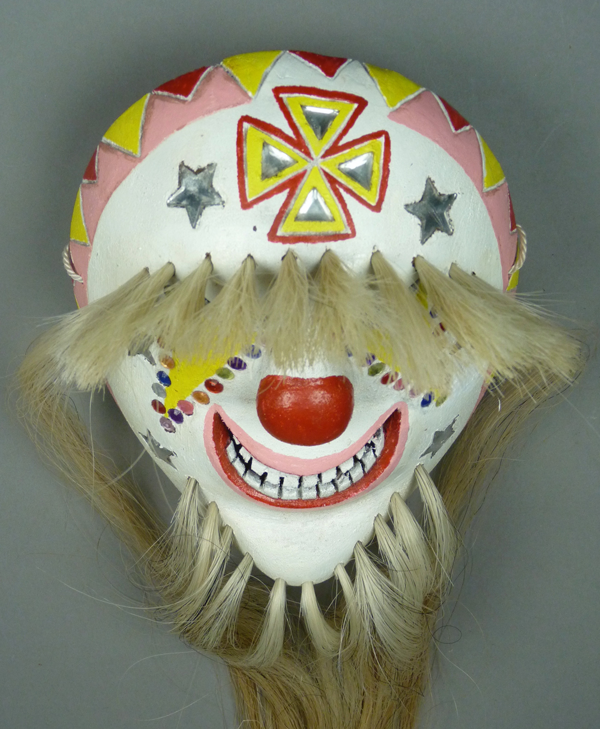 This is another of Crisencio’s masks with magnificent hair. 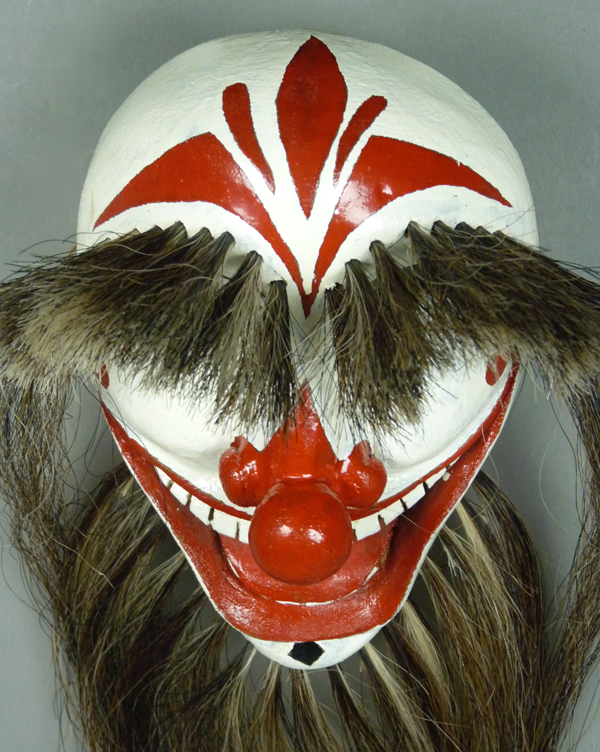 There are 20 bundles across the brow, and 17 more around the chin. What is difficult to see from this angle is that the chin juts down so far below the back. 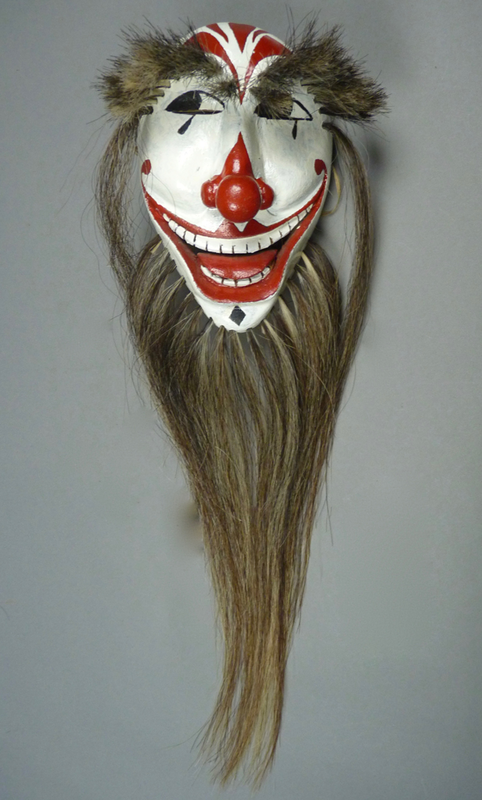 The mask is 8 inches tall, but measures just 7 inches from the top down to the inside edge of the chin. Otherwise, it is 5½ inches wide, and 4¼ inches deep, from the back edge to the tip of the nose. 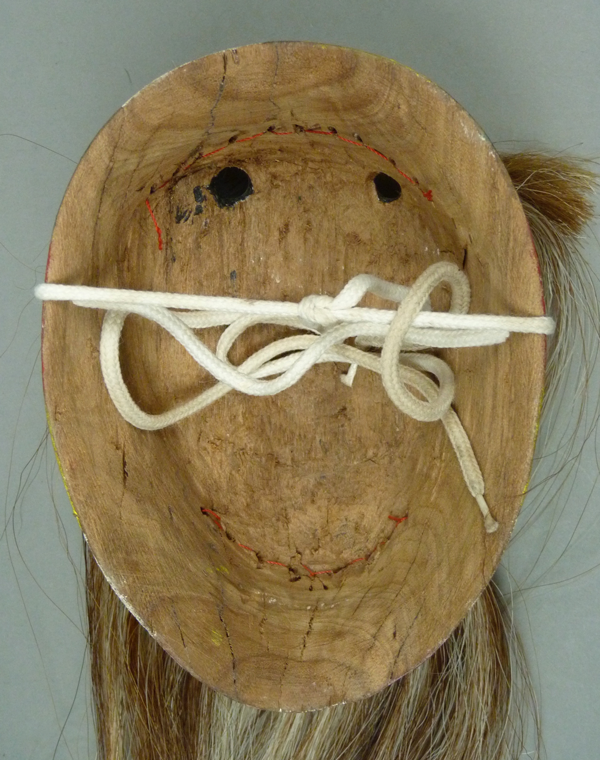 Next week we will look at goat faced masks by Crisencio Molina Maldonado.